Larry Booth and Roger Booth have written a practice guide for plaintiff’s attorneys around the country, entitled Personal Injury Handbook, that has just been published by James Publishing. The book, which was the result of over four years of work, contains hundreds of specific tips gleaned from a combined total of 70 years of legal experience, plus a variety of practice aids and forms. In addition to offering general tips on investigation, discovery and trial, the book contains chapters on 14 specific types of cases. Includes 140 forms, 60 checklists, 600 pages, full-text CD. "In their great new book, Personal Injury Handbook, trial lawyers Larry Booth and Roger Booth offer something more precious than legal forms, case law and procedural guidance: they offer wisdom. This is a book I wish I’d had in the beginning of my career but I’m happy to have it now! Buy it and apply the wisdom it contains." 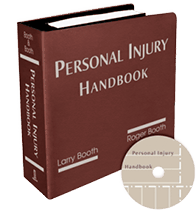 "The Booths’ Personal Injury Handbook has been indispensable to me in the development of my personal injury practice. Although I had an extensive background as a commercial litigator, I entered this practice area un-mentored and untutored. The Handbook saved me a tremendous amount of time and brought much needed clarity to practical questions that bedeviled my mind. I still refer to its excellent guidance and forms in my PI practice."